Find tips for making a beautiful bûche de Noël for the holidays and get our healthy yule log recipe. 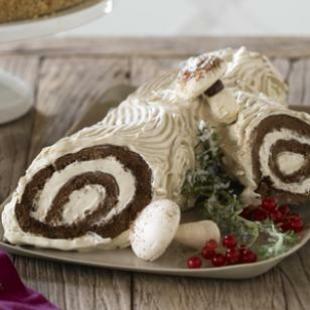 A bûche de Noël—a cake decorated like a yule log—is a traditional dessert served around Christmastime in France, Belgium, Canada and some other French-speaking countries. Some bûche de Noël cakes can be as heavy as a real log when they are decked out with sugar and buttercream. Our yule log recipe, which is just as tasty served cold as it is at room temperature, is lighter than air. Make a beautiful yule log for the holidays this year with our step-by-step instructions: Download a FREE Holiday Dessert Recipe Cookbook! 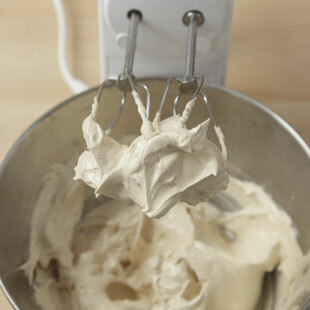 Beat the frosting until it is glossy and has the texture of very thick shaving cream. 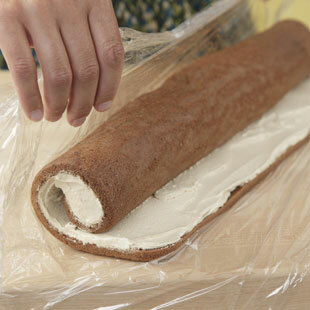 To form a log shape, hold the plastic wrap with both hands, lift the plastic up and over the filled cake to guide it as you roll. 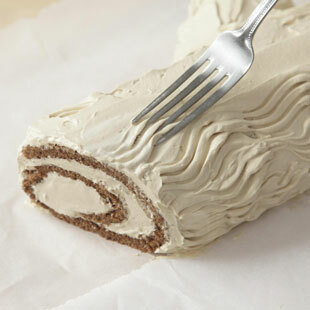 Use a fork to make decorative ridges and swirls in the frosting to resemble bark. For the prettiest rows of bark, dip the fork in hot water periodically to clean it. A bûche de Noël—a cake decorated like a yule log—is a traditional dessert served around Christmastime in France, Belgium, Canada and some other French-speaking countries. Some bûche de Noël cakes can be as heavy as a real log when they are decked out with sugar and buttercream. Our recipe, which is just as tasty served cold as it is at room temperature, is lighter than air. The chocolate brown-butter génoise cake made with whole-grain flour is easy to roll up and it’s covered with a billowy espresso-spiked 7-minute frosting. We’ve substituted agave nectar for white sugar in the frosting. It’s pretty garnished with meringue mushrooms and sugared rosemary.